Our state’s water resources including its streams, lakes, wetlands, marine waters, and groundwater provide ecosystem services in the form of recreation, drinking water, tourism, wildlife habitat, and industrial use. When rain water, also known as stormwater, carries salt, sand, soil, pesticides, fertilizers, leaves and grass clippings, oil, litter, and other pollutants into nearby waterways, it can negatively impact the ecosystem services that water body can provide. Because of these concerns, federal and state laws regulate surface and groundwater pollution from stormwater runoff. All projects that expose one acre or more in Washington State require a designated Certified Erosion and Sediment Control Lead (CESCL). NWETC is dedicated to helping you meet and exceed environmental regulations and understand stormwater policy. We want to help you remain free of regulatory violations, which can cause projects to run over budget and over time. Certified Erosion and Sediment Control Lead (CESCL) certification is required in the state of Washington and Oregon by the Washington State Department of Ecology (DOE) and the Oregon Department of Environmental Quality (DEQ) for personnel responsible for construction stormwater inspections and sampling at construction sites. Our Washington stormwater certifications are valid in Oregon. Additionally, our Oregon stormwater certifications are valid in Washington. Attendees who complete the course will receive a WA CESCL card, valid for three years. Hands-On Field Practice Sets Us Apart. 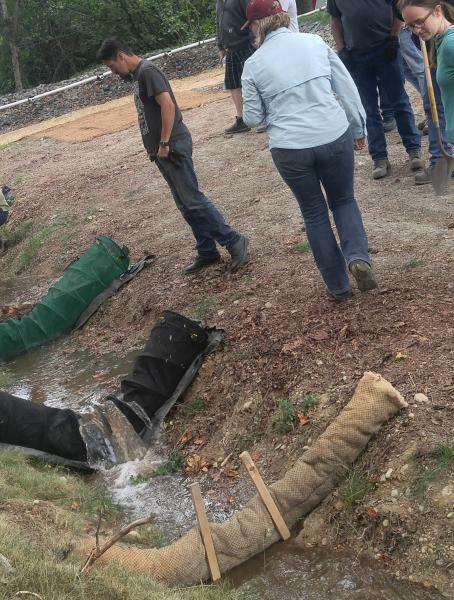 Our 2-day training ends with hands-on application of skills and concepts learned during the course, with students installing stormwater BMPs and testing their BMPs as we open a water hose and evaluate the results. Our courses are ideal for municipal workers, environmental consultants, agency personnel, and others who need to understand the erosion and sedimentation processes, regulations, the permit process, and techniques to prevent erosion. Don't let your stormwater certification expire! Re-certify within three years and remain a stormwater certified CESCL. NWETC offers a convenient, online CESCL Re-Certification Training course. Take our online CESCL stormwater recertification any time, at any location, and at your convenience! Join a stormwater certification class, or request a private stormwater training class. We offer stormwater training in multiple formats: in a classroom, or at your facility, using your operations as an example. Click here to find an upcoming CESCL Stormwater Training Course near you.